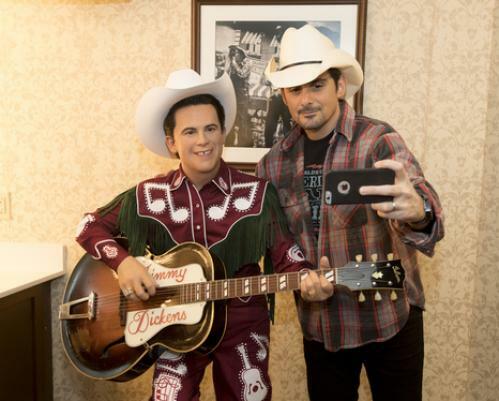 Madame Tussauds, the world-renowned wax attraction slated to open its newest location in Nashville this spring, and country superstar Brad Paisley joined forces to pay tribute to Grand Ole Opry legend Little Jimmy Dickens. While appearing on Saturday night’s Opry at The Ryman show, Paisley honored his longtime friend by playing the Little Jimmy Dickens hit “Out Behind the Barn” and unveiling the late singer’s figure to a sold-out audience. Little Jimmy Dickens, famous for his humorous novelty country songs and his small 4-foot-11-inch stature, had a profound impact on country music. Not only is Dickens credited for introducing rhinestone-studded outfits to live country music performances, he was also the first country artist to circle the globe while on tour. He is a member of the Country Music Hall of Fame and was inducted into the Grand Ole Opry more than 60 years ago. Dickens was the oldest living member of the Opry before his death in early 2015. Each Madame Tussauds figure is truly a work of art, involving teams of professional artists and sculptors who spend months on extensive research and take more than 300 measurements to recreate world-famous icons, to achieve the kind of astonishing realism that has been at the heart of the 250-year Madame Tussauds legacy. The life-like figure, which portrays Jimmy from the 1960’s, is adorned with one of Dickens’ signature rhinestone-studded suits designed by his original tailors, a “JD” ring, cowboy boots and cowboy hat. His figure’s friendly, relaxed expression was decided upon by his wife so guests had the opportunity to experience the twinkle in his eye. His figure will be perched on a stool, playing a personalized guitar in a broadcast setting within the attraction. With a completely different concept, the attraction in Nashville will be the company’s first offering in the U.S. that focuses solely on music icons that have shaped America’s musical landscape. Guests are encouraged to have fun with the famous stars from musical genres such as Country, Rock n Roll, Jazz, Blues and Pop. Additional figures hitting the stage at Madame Tussauds Nashville include Carrie Underwood, Stevie Wonder, Taylor Swift, Beyoncé, Minnie Pearl and Johnny Cash. More artists will be added to the bill within the coming weeks. Guests can save $5 off the regular price by purchasing early bird tickets to the attraction. The tickets can be redeemed anytime following the grand opening until the end of 2017. Purchasing early bird tickets will provide guests with the opportunity to be one of the first to experience the attraction. These limited-time-only tickets are $19 for adults and $14 for children ages 3-12. Prices will return to regular attraction price following the grand opening. Ages two and under are free.